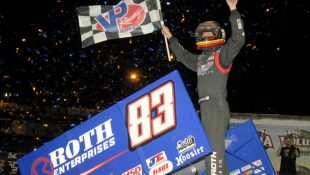 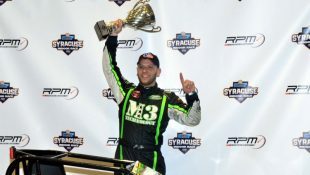 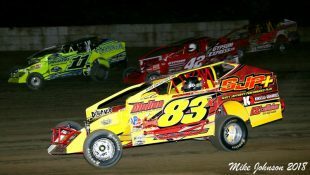 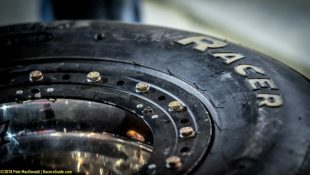 CONSTANTINO EARNS FIRST KOD VICTORY AT FONDA :Racers Guide – The Web's #1 Racers' Online Directory! 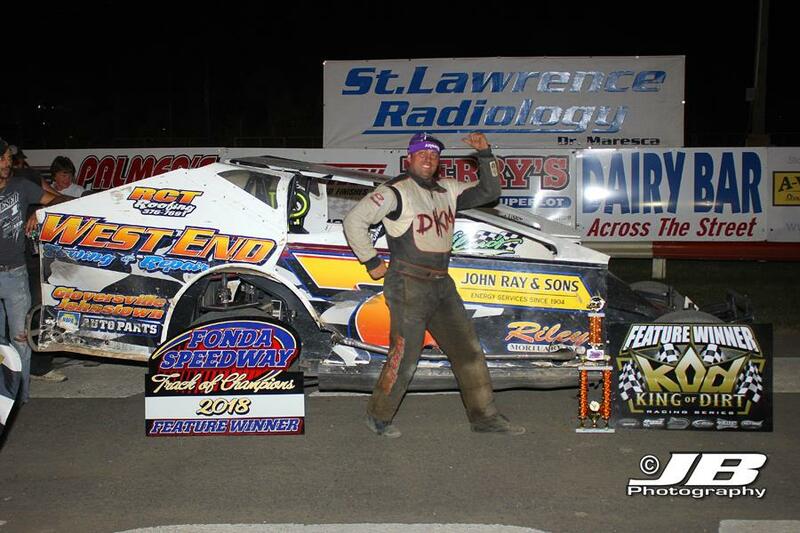 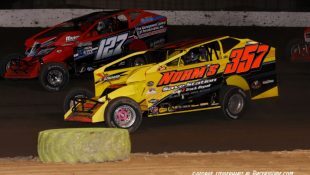 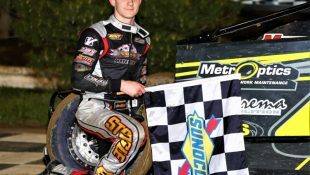 July 16, 2018 (Fonda, NY) – David Constantino has been bad fast in previous King Of Dirt Racing Sportsman events, but victory has eluded the DKM driver. 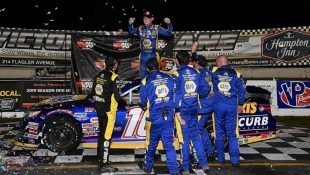 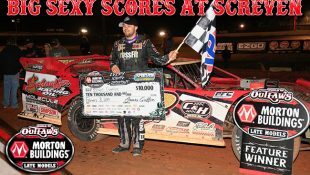 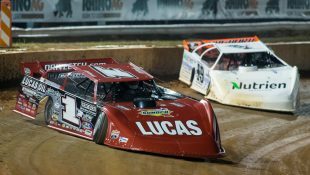 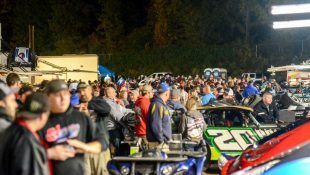 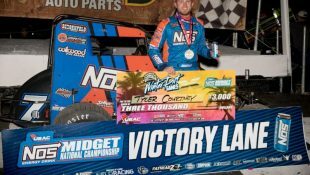 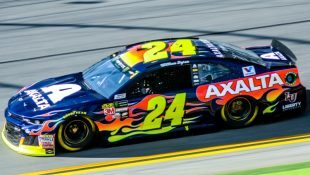 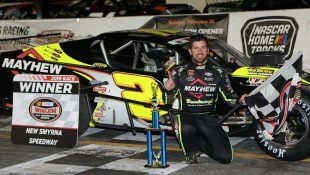 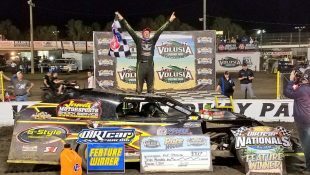 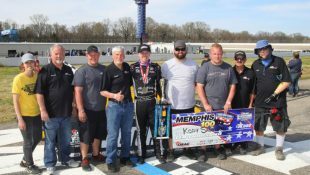 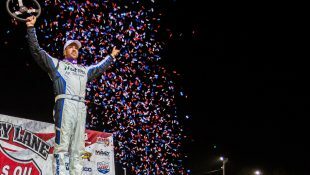 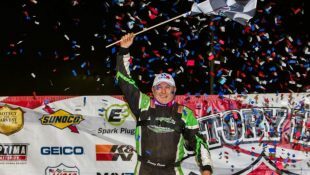 That is until Saturday night at the track of champions, where Constantino fought his way to the lead and held off late race challenges from Jeremy Pitts to earn his first career KOD Sportsman tour victory. 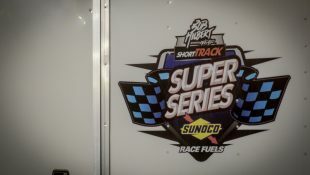 The night started off with the unique format used by King Of Dirt Racing, which utilizes timed hot laps to lock in the Burt’s Tree Service Super Six to the A-Main redraw. 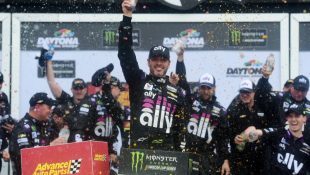 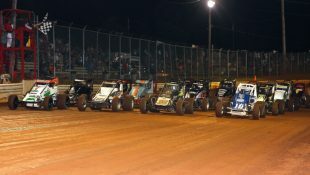 Those drivers included David Schilling, Tim Hartman Jr., Cody Clark, Dave Constantino, Josh DeMagistris, and Jeremy Pitts. 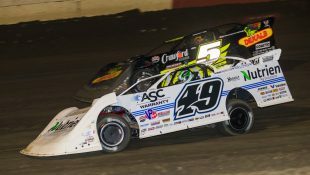 Qualifying mains got off to a rocky start with both tour point leaders Connor Cleveland and Chad Edwards being set back two positions for jumping consecutive starts. 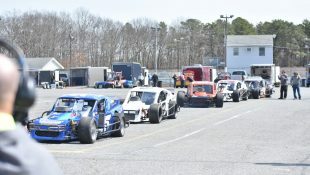 The following restart the 21c of Brian Calabrese jumped the restart and was subsequently penalized the same two positions, but at the conclusion of the 12 lap event placing him third. 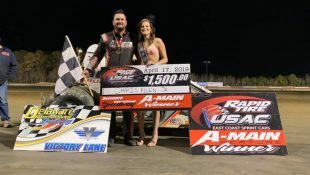 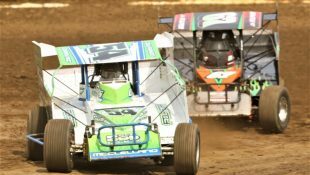 A-Main feature time rolled around with Tony Farone and Aaron Burton would bring the field to the green flag for the ‘Clash Of Champions’ event at Fonda Speedway, with Farone jumping out to the early lead. 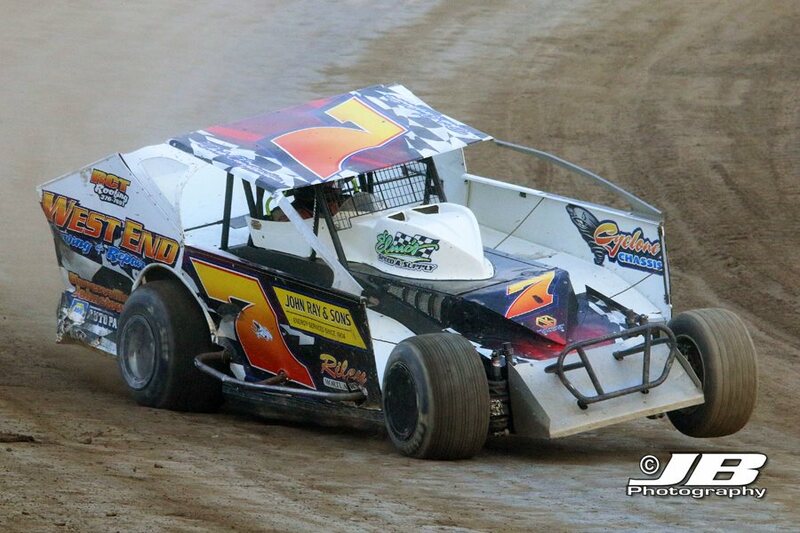 Dave Constantino wasted no time in moving from his third starting position to challenging for the lead early. 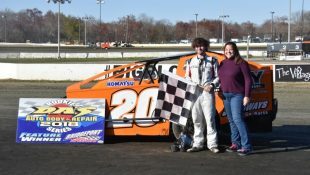 Jeremy Pitts followed through to third leaving Burton to battle with Josh DeMagistris and Michael Sabia for spots in the top five. 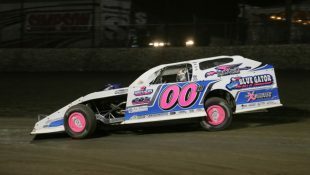 Constantino made his move for the lead go high, wide, and handsome around Farone who would surrender the lead and later retire to the pits with front-end suspension issues. 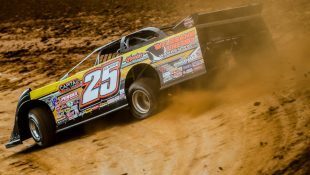 While that was happening it would appear early race misfortunes showed King Of Dirt Racing Sportsman tour point leader Connor Cleveland slipping back and second place point man on tour Chad Edwards charging forward from his 16th starting position. 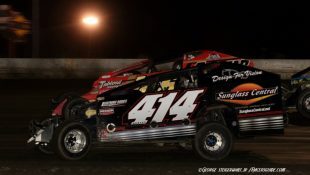 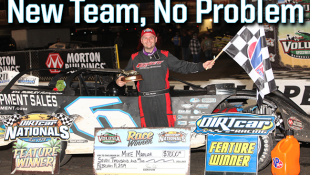 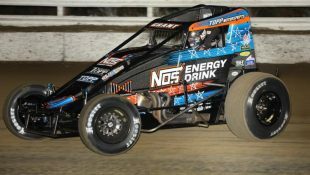 Tim Hartman Jr. an early race favorite saw his night end early with front-end damage in turn four, while Ray Zemken and Aaron Burton saw their evenings cut short with an accident for the 1z and mechanical troubles on the 26a. 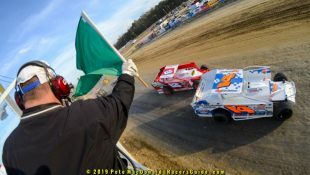 At the mid-way point in the race Constantino was holding strong in the top spot, while a few guys were making noise charging through the field. 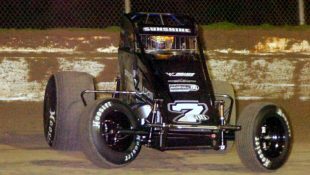 The aforementioned Chad Edwards had drove from 16th to 3rd and looked to challenge Jeremy Pitts for the runner up spot, while David Schilling had driven from 10th to 4th. 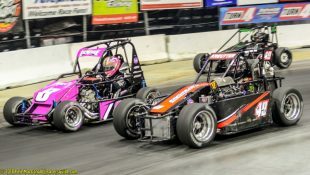 Track regular Nick Scavia had moved from 11th to 5th, but big movers in the race were Mark Mortensen who started 25th and Brian Borst who started 29th were both racing for top 10 positions. 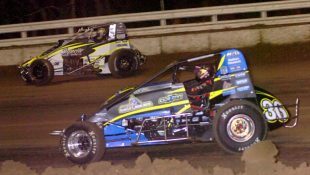 In the closing stages Jeremy Pitts had a couple late race restarts to challenge Constantino for the lead, but the DKM Cyclone chassis was flying high and drove home to the win. 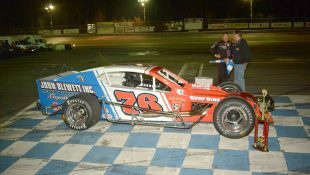 Pitts settled in for second, while Connor Cleveland rebounded soundly for a strong third place run. 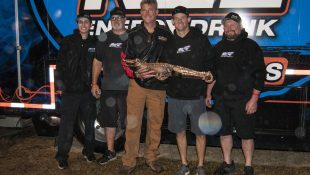 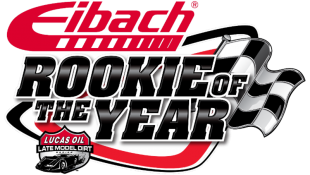 David Schilling, Nick Scavia, Cody Clark, Brian Borst, Robert Bublak Jr., Josh DeMagistris, and Brian Calabrese rounded out the top 10. 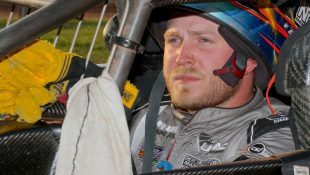 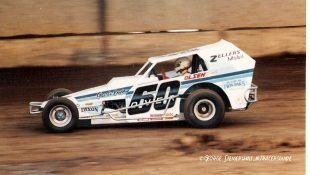 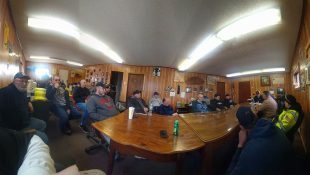 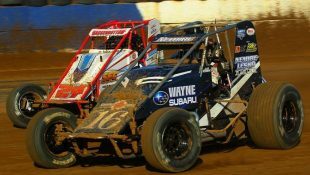 Cleveland padded his points lead over Edwards who was being filmed for the first episode of Dirt Rush season two by Dave Whitney and Whitney Productions. 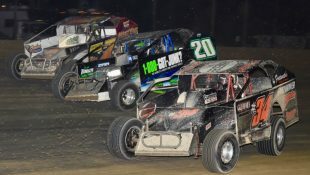 The Road To The Nationals only has two stops left with the next race being September 1st at Lebanon Valley for Mr. Crate Track USA followed by championship night at Albany Saratoga for the Northeast Crate Nationals on September 7th. 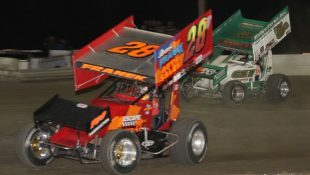 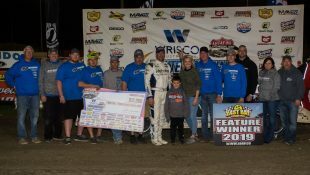 On a final note, Fonda Speedway promoter Pete Demitraszek expressed his gratitude and appreciation to his home track drivers with a show of humble gesture. 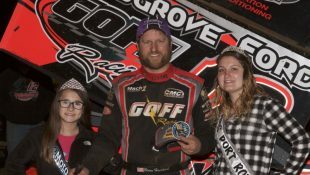 He paid the KOD entry fee for his top 20 drivers in Fonda track points. 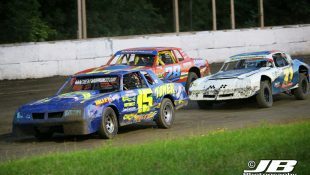 JULY 14, 2018 ANDY’S SPEED SHOP KING OF DIRT RACING SPORTSMAN SERIES PRESENTED BY DODSON CONSTRUCTION A-MAIN FEATURE RESULTS (30 Laps) – 1) Dave Constantino, 2) Jeremy Pitts, 3) Connor Cleveland, 4) David Schilling, 5) Nick Scavia, 6) Cody Clark, 7) Brian Borst, 8) Robert Bublak, 9) Josh DeMagistris, 10) Brian Calabrese, 11) Mark Mortensen, 12) Dan Santabarbara, 13) Charlie Tibbitts, 14) Michael Sabia, 15) Ricky Quick, 16) David Manchester, 17) Mike Jackson, 18) Marty Kelley III, 19) Nate Furman, 20) Chad Edwards, 21) Rob Maxon, 22) Ray Zemken, 23) Griffen Mansmith, 24) Aaron Burton, 25) Tony Farone, 26) Kurtis Hohensheldt, 27) Tim Clemons, 28) Scott McCoy, 29) Tim Hartman Jr., 30) Jeff Holt. 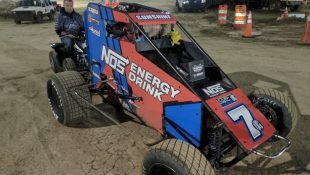 C-Main Qualifier Finish (12 Laps) – 1) Nick Scavia, 2) Aaron Burton, 3) Dan Santabarbara, 4) Mike Jackson, 5) Charlie Tibbitts, 6) Griffen Mansmith, 7) Marty Kelley III, 8) Brian Borst. 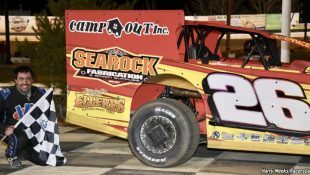 D-Main Qualifier Finish (12 Laps) – 1) Ray Zemken, 2) Tony Farone, 3) Robert Bublak, 4) Tim Clemons, 5) Ricky Quick, 6) David Manchester, 7) Kurtis Hohensheldt, 8) Nate Furman. 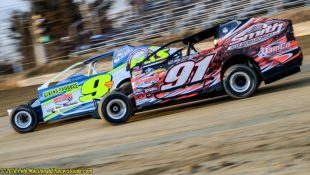 KING OF DIRT RACING is brought to you in part by sponsors and partners that include: Albany-Saratoga Speedway, Devil’s Bowl Speedway, Lebanon Valley Speedway, Utica Rome Speedway, Andy’s Speed Shop, Beyea Custom Headers & Exhaust, Bicknell Racing Products, Bill McGaffin Photography, Boss Mechanical, Bruno’s Towing & Recovery, Crane’s Outdoor Power Equipment, DKM Fabrication, DMC Racing Products, Dodson Construction, Elmo’s Speed Supply, Extreme Speed & Performance, Fast Axle, Fastline Performance, Flach Performance Products, Fox Racing Shocks, HICO Fabrication, Herrington Farms Inc., Hoosier Racing Tire, Jay’s Lawn Care & Landscaping, J-Tees Screen Printing, Killer Crate Engines, Lebanon Springs Excavating, Mayhem Motorsports, Mueller & Sons Towing/Recovery, NAPA Auto Parts Of Gloversville/Johnstown, R3 Graphics, Race Pro Weekly, Redline Graphics, Saratoga Masonry, Simplicity Designs.